It has been along time since a left-hander has started a game for the Phillies. No lefty started a game for the Phillies in 2017. Now a reliever, Adam Morgan was the last lefty to start a game in September of 2016. As things stand right now the team still has no lefty starter on its 40-man roster for the 2018 season. The Phillies have a long history of left-handed starters from Curt Simmons of the Whiz Kids days to Chris Short in the 1960’s to Steve Carlton in the 80’s and Cole Hamels most recently, the Phillies have had some of the best southpaw starters in baseballs. But not now. So today was a special day at the Carpenter Complex for the Phillies as they paraded out three left-handers in an intra-squad game on Ashburn Field. They were Jo Jo Romano, McKenzie Mills and Kyle Young. They all could be in the running to break the long stretch of exclusive right-handed starters on the major league team. The 21-year-old Romero, a fourth round draft pick in 2016 is the favorite. In a season and half in the Phillies system he has a 12-5 record in 33 starts after stops in Williamsport in 2016 and Lakewood and Clearwater in 2017. He did nothing to change his front runner status today by striking out the side in his first inning of work. Watch HERE. Mills is 22-years-old and was acquired from the Washington Nationals last season in the Howie Kendrick deal. He had a breakout season with Hagerstown in the SAL with a 12-2 record where struck out 118 in 104,2 innings. He struck out one is his first inning of work. Watch his first inning HERE. The 20-year-old Young was drafted in the 22nd round of the 2016 draft. He is listed at 6’10” but looks taller. He had a big season with Williamsport in 2017 going 7-2 in 13 starts with a 2.77. striking out 72 in 65 innings. He struck out two in his one inning of work in today’s game. Watch HERE. The Phillies do have left-handed starters on the way. The only question is when will they arrive on the 25-man roster. Today on a back field in Clearwater in an inter squad game was a preview of who they might be. 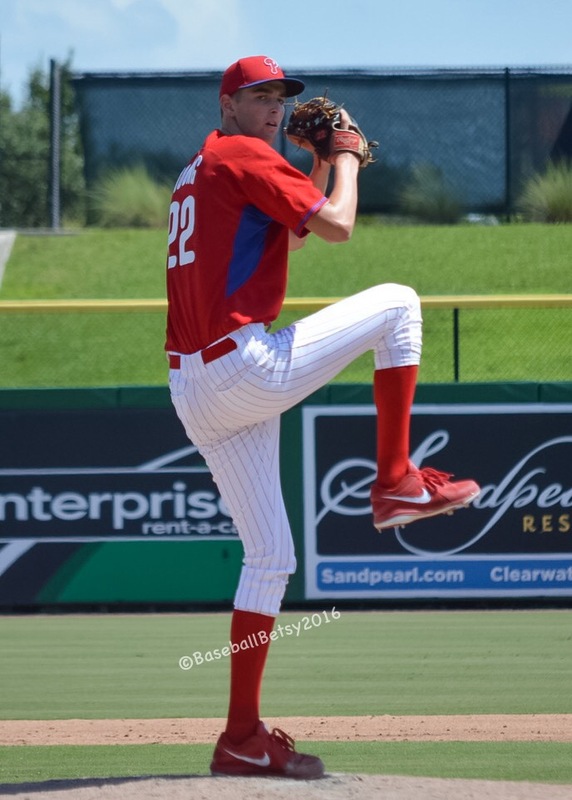 This entry was posted in 2018, March and tagged JoJo Romero, Kyle Young, Mackenzie Mills, Philadelphia, Phillies, Spring Training. Bookmark the permalink. Ranger Suarez is a left handed starter on the 40 man and JoJo Romero is 21, not 22. I love your site, you and your wife are doing a great job. I live near Williamsport and have followed them since going to Bowman Field and watching Ray Culp and Ritchie Allen.